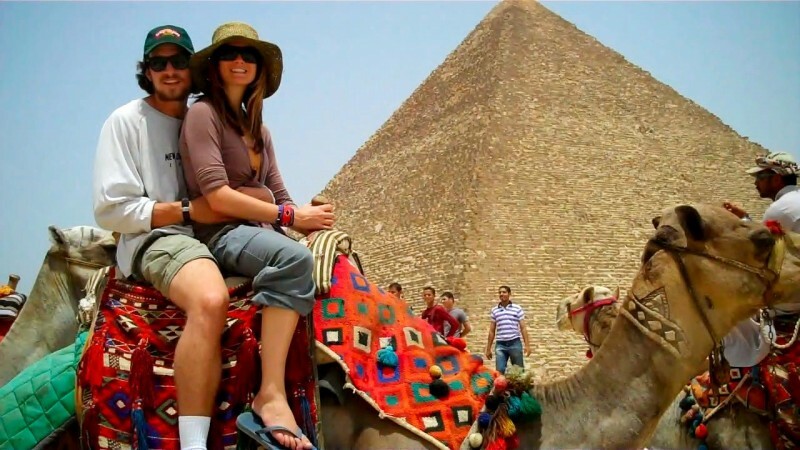 Adventure Egypt Travel Package was made to give you the chance to explore the main attractions of Egypt. A 15 Day tour to Cairo, Luxor, Aswan and the famous Egyptian desert, the white desert and the black one , Baharyia oasis with its famous landscapes and beautiful nature. Memphis Tours representative will meet & assist you at Cairo International Airport. After that you will be transferred to your hotel by a private air-conditioned vehicle. Upon arrival at the hotel he will check you in and give detailed information concerning your tomorrow’s trip. Breakfast at your hotel in Cairo and then met your personal guide who will accompany you to Giza Plateau to visit one of the seven wonders of the ancient world, the Great Pyramids of Cheops, Chefren and Mykerinus and Sphinx then to the Valley temple facing the great statue. Have your lunch at a good quality local restaurant. Then transfer to enjoy the Egyptian Museum, Treasures room for the child king Tutankhamen. Proceeding to Coptic Cairo to visit the Hanging Church and Ben Ezra Synagogue. Combining fascinating history with shopping in a lively Khan El Khalili Bazaar, which dates back to 1382. Back to hotel. Overnight in Cairo. Memphis Tours representative will pick you up from your hotel in Cairo, then drive to Alamein, about a 3 hour drive. At Al Alamein, you will enjoy the site where the great battle took place during WW II, and visit the WW II Museum and the Cemetery. Then drive on to the beautiful bay of Marsa Matrouh on the Mediterranean Coast then continue to Siwa. It is about a 6 hours drive from Alamein to Siwa. Dinner and overnight in Siwa. Breakfast at the hotel – then enjoy the visit to the Old City of Siwa ( Shali) – then continue to Visit The tombs inside the Mountain of the Dead ( Gabal El Maouta ) enjoying watching some interesting tombs like SI Amon, MSW Isis, Crocodile Tomb. Then transfer to Abu Sherouf, one of the Siwan Villages to enjoy the Bedouin style life and enjoy the Roman Spring eye and handcraft. Then transfer to visit Cleopatra bath and the Alexander Temple, at Aghurmi Village which is dedicated to the God Amon- 26 Dynasty. Dinner and overnight in Siwa. After breakfast, you will be transferred by 4x4 car to Bahariya a 06 hour journey. Lunch served during your trip to Bahariya. Then enjoy a trip to the ruin on a hill, "the English House" and enjoy the panoramic view. Dinner and overnight in Bahariya Oasis. Breakfast, enjoy your visits in Bahariya Oasis. Enjoy a tour around the old village and see the groves of palms and fruit trees.Then onto the Mummies Museum from the Graeco-Roman period, then visit the Tombs of the Nobles. Lunch in Bahariya. Head to the White Desert, passing through the Black Desert and the Valley of El Haize with its famous spring. Stop off to see the quartz crystal at Crystal Mountain, the petrified wood and volcanic rocks in the Valley of Agabat. Bedouin dinner and entertainment. Overnight camping in White Desert. Drive to Farafra Oasis where you can see the palm groves and hot springs as well as the old village of traditional mud brick houses and local artist Badr's unique mud brick museum. Enjoy a trip to the Roman temple Deir El Hagar in its serene surroundings and the Roman burial ground Mezzawaqqah. Then pay a visit to Islamic Village of Al Qasr, about 35km from Mut, houses ruins of an Ayubid mosque. Then move onto the lush Dakhla Oasis, surrounded by rose-colored cliffs. Overnight in Dakhla at Oasis Style Hut. After breakfast move onto Kharga Oasis to visit Qasr el Labkha - a Roman fortress on the old caravan route, and the oasis' ethnic museum. After that visit the Roman Temple of Hibis from outside as well as the early Christian cemetery with its chapels painted with murals at Bagawat, nearby. Move onto Nadora Temple and the Temple of Dush, dedicated to Isis and Serapis, and see Baris Oasis. Overnight camping in Kharga. After breakfast, you will be transferred by vehicle to Luxor; it takes about a 06 hour driving. Overnight in Luxor. After breakfast, transfer to then taken by an air-conditioned vehicle to board your 5 star Egypt Nile cruise to check in. After lunch on board, enjoy a visit to the impressive Karnak Temples and Luxor Temple. Dinner and overnight on board Nile cruise. After breakfast on your Nile cruise, take an excursion to the royal cemetery for 62 Pharaohs, Valley of the Kings, then to mortuary Temple of Queen Hatshepsut, which was built by the architects of the New Kingdom Pharaoh Hatshepsut in the 15th century BC. Proceeding to the Colossi of Memnon. After lunch, you will sail to Edfu enjoying a leisurely dinner on board. Overnight on board Nile Cruise. Day 12 :Edfu / Kom Ombo Temples. After breakfast on Nile Cruise, visit the well-preserved Ptolemaic Temple dedicated to Horus at Edfu. Sail to Kom Ombo to see the unique Temple of Sobek, dedicated to Sobek the crocodile god, and Horus the falcon-headed god. Lunch on board. Continue sailing to Aswan. Dinner and overnight on board you deluxe Nile Cruise. After breakfast on Nile cruise, enjoy a day’s sightseeing in Aswan. Start with the High Dam and the largest known ancient obelisk, located in the northern region of the stone quarries of ancient Egypt, the Unfinished Obelisk, then on to the beautiful Temple of Philae, which is devoted to the two goddesses Isis and Hathor. Dinner and overnight on board deluxe Nile Cruise. Disembark from your Nile cruise after breakfast, then transfer to Aswan airport for flight back to Cairo. Upon arrival you will be transferred to your hotel, overnight in Cairo. After breakfast, transfer to Cairo International Airport for final departure. Accommodation for 3 nights in Cairo including breakfast and taxes. Accommodation for 2 nights in Siwa Oasis on full board. Accommodation for 1 night in Bahariya on full board. Accommodation for 1 night camping in White Desert on full board. Accommodation for 1 night in Dakhla Oasis on full board.